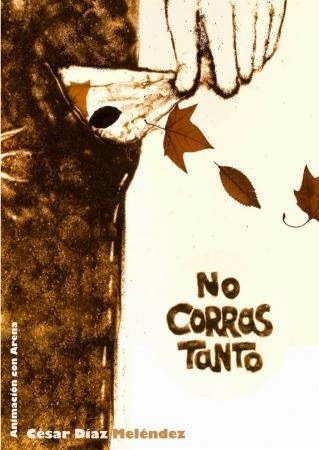 I’m always on the lookout for interesting short films, and No Corres Tanto definitely fits the bill. Released in 2009, No Corres Tanto (which, in English, translates to Take It Easy) is a unique animated movie in that it was created entirely with sand. At times using nothing but his bare hands, its director, Cesar Diaz Melendez, drew a series of pictures in sand that had been laid out on a glass surface, which he then shot, frame-by-frame, over the course of 3 months. The resulting film, which runs about 5 minutes, is, to put it mildly, quite astonishing. With music supplied by the group El Combolinga (a band that Melendez himself is a member of), No Corres Tanto presents an explosion of images, from the everyday (people walking; a trip down a city street; etc) to the more complex (in one scene, the faces of a man and woman, who are locked in a passionate kiss, merge to form a single person). In addition, its central theme, man’s oneness with nature, is explored time and again throughout the movie (aside from several snippets where people morph into animals, there’s a wonderful sequence featuring a flower that grows and promptly withers, at which point the soil around it is transformed into dozens of human hands). This is but a sample of what’s going on in No Corres Tanto (what Melendez manages to squeeze into the movie’s abbreviated run time is beyond amazing), and the only way to appreciate all it has to offer is to watch it yourself (which you can do below). It’s an experience I wholeheartedly recommend. That was pretty incredible and totally different! The scope of stuff you cover here never ceases to amaze me. Needs an award for this.